We really love the school our kids attend. It’s a fairly small, private school with a high percentage of international students and really, really nice kids/parents. The school was started over 20 years ago by a group of parents from Insead, an international business school located in our town. Since the French school system, generally speaking, can be a bit severe and unwelcoming, this group of parents decided to create a school based on more of an American/UK model. Although this style of education is very unusual for France, over time, the school has attracted not only lots of international families, but also many French families who weren’t thrilled with the French schooling options. We’re happy to be a part of such an interesting mix of people and our kids love it there. About a month ago we received a flyer telling us that there was a big school event in which all of the families from around the world could represent their country at the annual cultural fair. Since there are very few American families at this school, our family got roped in to presenting the United States to the crowd. As far as directions for this cultural day were concerned, we were each going to be given a table with very non-specific instructions to “represent your country in whatever way you would like.” I didn’t spend too much time worrying about this project because: a) it’s a kids cultural fair; and b) I was spending lots of my emotional energy trying not to get eaten by the French kids in my ESL class. Ok, friends, I know that many people have a certain view of the US, but that one really hurt. In an effort to prove that we are not only the land of McDonald’s and Coke, I decided that I would show these international citizens a better side of our great country. The main problem was, where to start? In a country as big and diverse as the US, there is no easy way to represent it. I spent a bit of time considering my options, but we were a bit challenged because, since we’re here for only a short time, we didn’t bring all of our earthly American possessions so our tchotchke quantity is low. Tim’s quick trip back to the US for work provided an opportunity for us to stock up on some stuff, but he didn’t have much room for the loads of Americana I was hoping for. What he did manage to fit in his suitcase for the return flight was packs of Hershey’s Kisses, Tootsie Rolls, and Tootsie Pops, some small American flags (thanks, Erin!) and some flag stickers. While planning for this event, I tried to think about times in the US when I’ve been to a similar cultural event and every time, there seemed to be a heavy emphasis on the food of the culture, so I thought I would dazzle the masses with some home-baked American treats – namely chocolate chip cookies and brownies. The day of the event finally arrived and in addition to the baked goods, candy, flags and stickers, I threw in a bigger American flag, some children’s books from the US and a US map for good measure. I also threw in a place mat of the American Presidents for some increased cultural perspective. I tried to get the boys to gather some of their favorite books or movies or other things American, but they were worried that somehow their favorite things would get lost of disappear at this event and they convinced me that we had amassed plenty of stuff. At the very last-minute and as my secret weapon, I threw in the original 45 record of the Village People singing YMCA that Eamon bought at my local all-star junk place, Emmaus. If the Village People can’t win over a crowd, I don’t know what can……..
As soon as we walked in, I knew we were in trouble. And I’m not talking about a little bit of trouble, I’m talking about MAJOR trouble. I’m talking about the giant poster boards with cultural events, native musical instruments and traditional cultural costumes, kind of trouble. Unfortunately for US, we were between Korea and DOM TOM, which are the overseas and offshore territories of France like Guadeloupe. Apparently, these are two very overachieving places to live. The list goes on and on and it doesn’t get any easier to digest. I should also mention here, that there was NO cultural food in sight. I seriously wanted to HIDE under our table. No amount of American flag propaganda could outdo these other countries. The only good location for the USA table would have been next to the Ukraine table who didn’t bother to show up. Let’s just say, that the next 4 (!) hours of standing behind the USA table was a blur of self-doubt mixed with mulled wine (a holiday staple in France, even at school events). The most consistent question that I heard at our table was, “Where is the peanut butter?” Even though I quickly pulled out our Village People record, even it could not save the USA table. At one point a French friend of mine walked by our table and said, “Oh Tootsie Rolls! I remember Tootsie Rolls from when I lived in the US! I never liked them, though. The French hate Tootsie Rolls.” I guess we were doomed from the start………. In retrospect, I spent a little bit of time thinking about what I/we could have done better that day, but I keep coming back to the fact that the US is a complicated cultural place. There is no one way to be. There are no real cultural costumes, unless you count sweatpants, and there are no instruments that are universally agreed upon as uniquely American, unless you consider the kazoo. In the end, I realized that although I felt like a complete American failure, it didn’t matter what I thought, because it was for the kids. With bated breath, I asked Owen what he thought of our table and which table he liked the best, hoping that he wasn’t feeling my pain/shame. He replied, “Are you kidding? The USA table was the best! We had the best food! Everyone thought so.” I’m so glad he didn’t seem to notice that we had the ONLY food. Apparently, no amount of intricate paper weaving or native musical instruments can kill American pride. And I’m pretty sure it’s more fun to stay at the Y.M.C.A. than spend 4 hours in a Heidi costume. This was the painful view of the Korea table from the USA table. 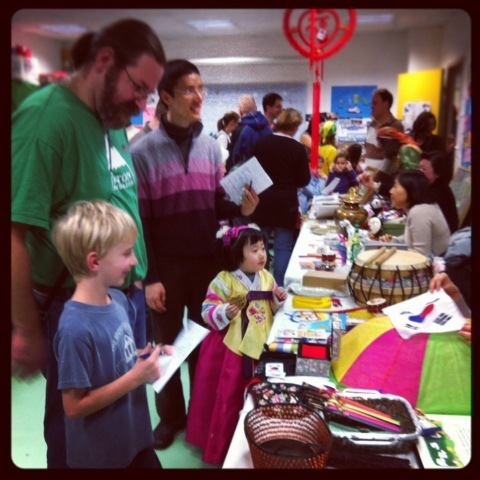 This entry was posted in culture and tagged cab, cultural fair, korea, usa table. Bookmark the permalink. Steph,, you are so right – USA is so diverse that it cannot be defined or symbolized with any (few) items. If an American had been there, the display of the flag alone would have evoked great feelings of patriotism! I’ve been thinking about what I would have done in this situation and came up with next to nothing. Unfortunately, our country generally is viewed quite negatively by the world – sort of a love/hate relationship as they envy our freedoms but are put off by our arrogance. I read your blog with great interest and envy – your writing style makes it so much fun to read! Thanks for sharing your life in France! Brian said he could have sent you some Native American crafts, etc. The French may hate Tootsie Rolls, but apparently they love to fetishize Native Americans! I’m sure you did us proud…especially with the brownies! Just for the record, Denmark may need to retract part of their Lego display. Lego now has a Large production facility in Mexico and Hartford,CT brags on how they are involved with Lego with their displays at their Children’s museum and the Eastern States Expo.! !